Oh, what a night! 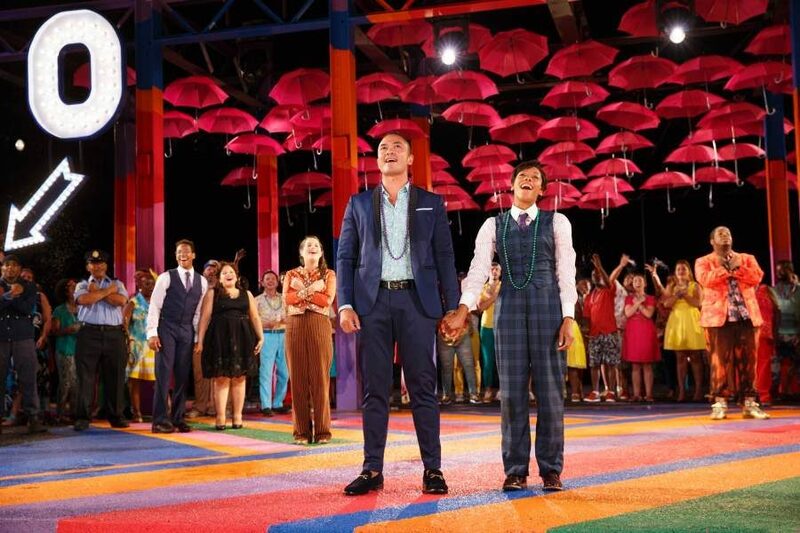 Although somewhat overcast with rain and thunderstorms in the forecast, the mood onstage for Twelfth Night in Central Park at The Delacorte Theater couldn’t have been sunnier! Twelfth Night is a typical Shakespearean comedy with disguises, mistaken identities, and frustrated love. Viola and her twin brother Sebastian are caught in a shipwreck and neither knows if the other has survived. They both land in Illyria where Viola disguises herself as Cesario and gets a job with Duke Orsino. She is understandably upset when she falls in love with him but he sends her to help him woo Olivia. Predictably Olivia falls in love with “Cesario,” the disguised girl. There’s a second, broader comic plot involving Olivia’s uncle Sir Toby Belch (Shuler Hensley). Sir Toby schemes with other characters to humiliate Malvolio, Olivia’s pompous servant, getting him to dress in yellow clothing and act quite mad. Although I was disappointed that Nikki M. James (The Book of Mormon) was unavailable for the performance I attended, the understudy for Viola, Kim Blanck, did a fine job. With her strong voice and pleasant demeanor, she brings sincerity to the role, especially when she sings about disguises and how wearing her brother’s suit gives her strength. Hensley is riotous as the drunken loutish Belch. The original Shakespearean play runs close to 2 hours and 45 minutes, but the Central Park version only runs for 90 minutes with no intermission. Original music by composer-lyricist Shaina Taub, sometimes played on accordion, sometimes with the onstage band, moves the story along and trims the running time in half. Taub created a more integral part for herself in the musical and although she plays Feste, Olivia’s “fool,” she really is a street singer who knows all the town news and gossip. Listen carefully to the words of Taub’s songs and you hear a 21st century sensibility, especially in terms of feminism and acceptance. Malvolio (Andrew Kober) explains how he was bullied as a child and Viola notes how different she feels wearing pants. The Public Theatre has presented free Shakespeare in The Park since 1962. For the last six years, Public Works has been working with the Public Theater to create participatory theater. The night I attended the show, the Red Ensemble, a group of 50 NYC residents, played the Illyrians. Professional actors intermingle with community-based organizations from all five boroughs. People of all ages, military veterans and children, young people and senior citizens, domestic workers and formerly incarcerated people are listed in the Playbill along with Equity actors. The Red Ensemble alternates with the Blue Ensemble. The combination of amateur and professional in the cast provides unprecedented energy, enthusiasm and spirit on the Delacorte stage. Although this is a Shakespeare comedy with no magic or spirits, there must have been some supernatural at work the night I attended the show. We sat through the show, applauded and gave standing ovations and walked from the open-air theater. And then…the skies opened and torrential rains fell. As the rain continued, obscuring our view and making driving difficult, the Weather Service even issued a tornado watch. Despite our soaking wet clothes, we were still basking in the sunlight of Illyria and Twelfth Night.